Zoey White, the chair of the Academic Affairs Committee, distributes a brochure, which is about budgeting tips, to participant during How to Beat the Game of Life event in the Alumni Lounge in the second floor of the Martin Luther King Jr. University Union Tuesday afternoon. 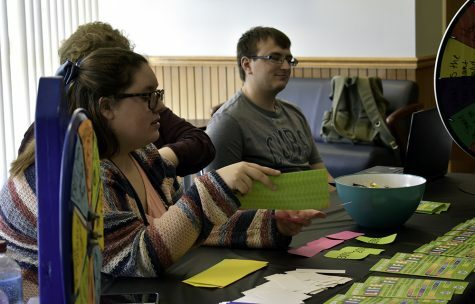 Students participated in games, answered questions about budgeting and finances and were able to ask some of their own at “How to Beat the Game of Life,” put on by the student government on Tuesday. 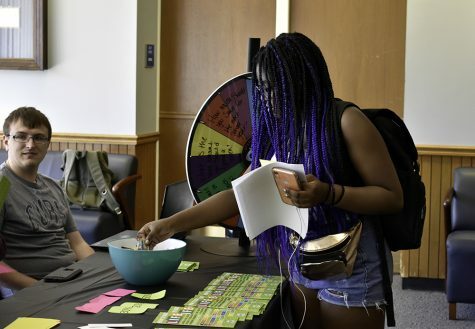 The event was designed to have interactive ways for students to learn more about budgeting and how they can be more responsible financially. Student Senator Randall Becker said he believes college students do not have much prior knowledge on budgeting but they should begin to learn. “Now that we’re jumping into adulthood, you don’t need to know everything, but it’s important that you know as much as you can, and it’s something to start thinking about,” Becker said. Chair of Business Affairs Zoey White said there are small, easy things students can do that will help them financially. US News reported that students surveyed in 2014 were likely to be in control of their finances and have one or more credit cards but likely did not have enough financial knowledge to allow them to manage their money well. Becker said it is hard for students to be prepared because they have never dealt with the kind of money they will be making when starting their careers. “When you take a bump from $1,200 or $12,000 a year to $24,000 or even six figures, you’re dealing with a lot more money, and you don’t know where it necessarily needs to go and where it’s going to trickle down,” Becker said. Offering budgeting or finance courses in high school is one thing students believe could help them be more financially responsible. Kayla Ruth, a freshman in Early Childhood Education major, picks candies after answering question about budget during How to Beat the Game of Life event in the Alumni Lounge in the second floor of the Martin Luther King Jr. University Union Tuesday afternoon. German major Crystal Whiteside says her high school didn’t offer any such resources but believes they should. “They should have certain programs that you can participate in or certain people you can talk to,” Whiteside said. Michael Perry, a political science major, said he thinks that personal finance classes should be required in high school. “I had one in my high school in Champaign, and I know a lot of high schools in more rural areas don’t have that but they probably should,” Perry said. Perry also added that the FAFSA website and Office of Financial Aid are good resources for students, but he feels you have to go out of your way for that information. Becker thinks the best way for students to become well-versed with budgeting is to talk to people who have experience doing so. “Talk to adults. Talk to your parents, teachers or someone over in financial aid. Humans are the best resource for this because you can Google these things, but you’re only going to get so far,” Becker said. He also said this event was a fun way to reach out and interact with students to see what they do and don’t know. “The idea of this event is specifically to get people thinking and develop a foundation of where they should be,” Becker said. Trevin Milner can be reached at 581-2812 or at [email protected].